Mugshot via Florida Arrest Records. 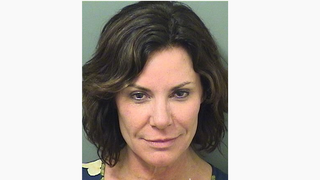 Luann de Lesseps of RHONY was arrested in Palm Beach early this morning for a drunken skirmish (a “rampage”! (TMZ)) with police officers. She has been released and will appear before a judge on January 25th and before a reality TV tribunal, date TBD. According to Palm Beach Post, de Lesseps allegedly told people “I’m going to kill you all” and kicked a police officer. She has been charged with four felonies–battery of an officer, resisting an officer with violence, and two counts of threatening a public servant–as well as disorderly intoxication in a public place. And that’s the latest on Luann de Lesseps.